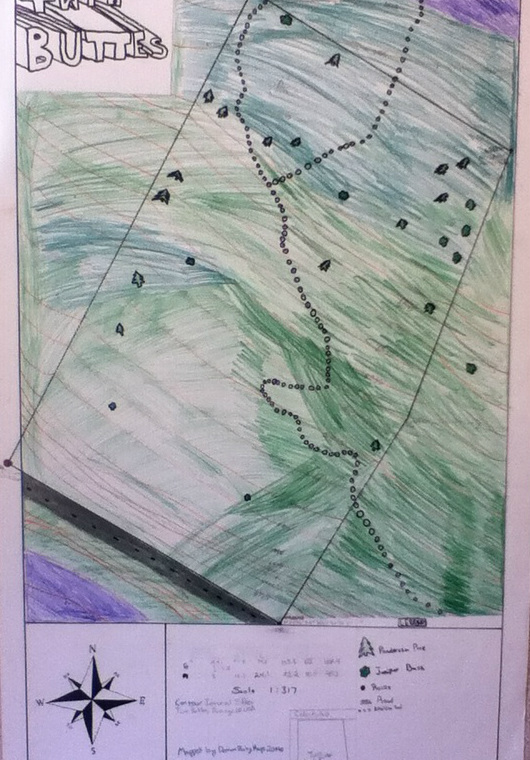 In this project we mapped a section of twin buttes. We had to measure angles me distance from each of the four rocks. The first couple weeks of the project we hocked up to our mapping area with a comps and gps. We used our compass and recorded the degrees we were walking and we counted how many paces we took to get to each rock. We later used the data we collected to graph our map. The first thing we did was draw a compass so we could put the rocks on the right direction. We made a grid on our paper and created a scale we would use to make our map. We started off buy putting one rock on the map and from there used our compass to fun the angle to the next rock based off of what we measured on our compass then we used our scale and paces to find out how long the line needed to be then we drew our second rock there and repeated the process. After we had put all our points on the graph we drew elevation lines. We then eat asked our grid and drew symbols for trees, bushes, roads, etc.... After we were done we added a legend. And for the last step we colored our map and titled it demonbabymaps! What we did first was go back 53m back and we got the highest angle and that was 12 degrees. Then we had to find the maximum height, and to figure that out we calculated 53 times the tangent of 12. After that we had to find the average velocity in m/s from max height. To find that we had to divide distance by actual time. Then from max height the calculations of hang time and theoretical hang time in second, we had to take the square root of the max height, divided be ½ of the acceleration. Then, for the percent error calculation, we took the actual flight time minus the theoretical flight time divided by the theoretical flight time. Then we multiplied that by 100% to find the percent error. Our actual flight time was 4.23 seconds and the theoretical is 3.03 seconds. Our rocket failed so we got a low flight time. Day 6, entry 1: Day after first fire. Today we will focus on installing a nose cone. If we end up doing that we will start crafting the wings. Day 7, entry 2: Todays objective is to make a quality parachute that goes under the nose cone. Day 8, entry 3: Today we do our first test launch. Day 9, entry 4: We are planning on refining the edges on our rocket. Day 10, entry 5: Today we will decorate the rocket. Day 11, entry 6: Test fire. Day 12, entry 7: Rocket blew up we are exempt from the exhibition DP work time. Day 13 entry 8: more DP work time. In my reflection I first want to talk on how well my group worked together. I don’t feel like we worked the best only because we are good friends and we tended to want to talk a little more than actually work. Although, when we started working we got a lot done it wasn’t like we did not have a rocket at all. One downside to us talking a lot though is that it wasn’t the highest quality of a rocket so it exploded. One other thing was the work time I feel like Dave did a good job with how free work time was. It was really open and free meaning if you didn’t want to do work you didn’t have to. I think that is good because it gives us a test of what it will be like when we are older on our own. Our boss won’t make us work they will just expect it’s done when they said it was due. If I were to refine what I did about my rocket I would probably want to change the fact that it blew up by getting new rockets and take better care of them because there were a lot of dents in it. Witch caused it to be week in some places so it exploded. Also I would redo the parachute because it was really sloppy all we used was tape string and a bag. We could have made it more high quality. One other thing I would have done different was our nose cone because it was just made out of paper taped into a cone shape. What I would have done differently was made the cone out of plastic or just something more durable. For the Rube project we had to build a contraption that goes through at least fifteen steps (A step was a transfer of energy.) and take fifteen seconds to finish but it had to do something like my end result was to kick a domino. What it is though is a whole bunch of contraptions put together to make kind of like a train reaction. We had to have three simple machines out of the six. The exhibition went well I got to set up my rube for the people and show them what me and my group made and I also got to show them the equations and the sketch up (3D blueprint).